Aled getting ready to run the repeated sprint test.As we look forward to this summer's European Championships, two Bangor University students have been assisting a new football team in Amlwch for a new series on S4C. Along with three other teams across Wales, this new team has been formed for Codi Gôl, a brand new series on S4C, broadcast Sundays at 8pm. These teams will consist of the mums and dads of junior football players from clubs across Wales, each managed by a former Wales international football star. Aled Vaughan Thomas, 21, from Llandegfan, Anglesey and Robin Owen, 21, Penygroes, both students at the School of Sports, Health and Exercise Sciences, were invited to provide fitness testing for the Amlwch team by Owain Tudur Jones, former Swansea, Inverness Caledonian Thistle and Hibernian player. 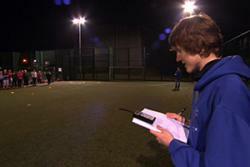 Aled explained: "I undertook various fitness tests to assess speed, agility and fitness of the Amlwch football team. This included 20 meter sprint tests where they made three efforts to enable us to measure their speed and measured their tiredness with the fatigue index. We also carried out the ‘Illinois Test' to test their agility. Finally, we used a heart monitor to enable us to see how hard the team works and at what intensity." Robin announcing the test results.About his experience of working with Owain Tudur Jones, Robin said: "It was great working with Owain. 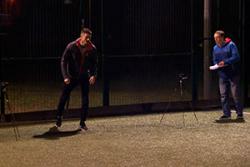 It was very interesting to see how Owain is using his experience of playing professionally to train his team." After a few weeks of training, the teams, based in Amlwch, Ammanford, Ffostrasol and Pwllheli, will then compete against each other at Newtown's Latham Park, with the winning team jetting off during the Euros to represent Wales in a match against a team of parents from Brittany. Codi Gôl, Sundays, 8pm S4C English subtitles.